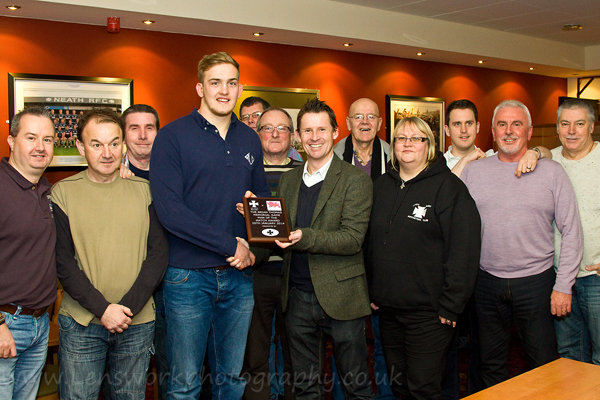 Congratulations to Jack Jones who was the recipient of the first Neath Rugby Supporters Club Man of the Match award. The award came for his display in Neath’s 29-5 win over Cambridge University at the Gnoll on Saturday. The match acted as a memorial for Neath’s great player and Team Manager Brian Thomas. It was therefore, perhaps fitting that the winner of the award was Brian’s grandson, Jack, who given his display seems to be following in his grandfather’s footsteps. Jack was presented with his award in the clubhouse by former Neath outside half Matthew McCarthy. Neath Rugby Supporters Club are hoping to make the Man of the Match award a regular feature, so look out for more winners in the future. This entry was posted in News and tagged Brian Thomas, Gnoll, Jack Jones, Neath. Bookmark the permalink.